Want to sell products with multiple options, like size, color, or style? Now you can. Now you can sell overpriced t-shirts in multiple colors and sizes. 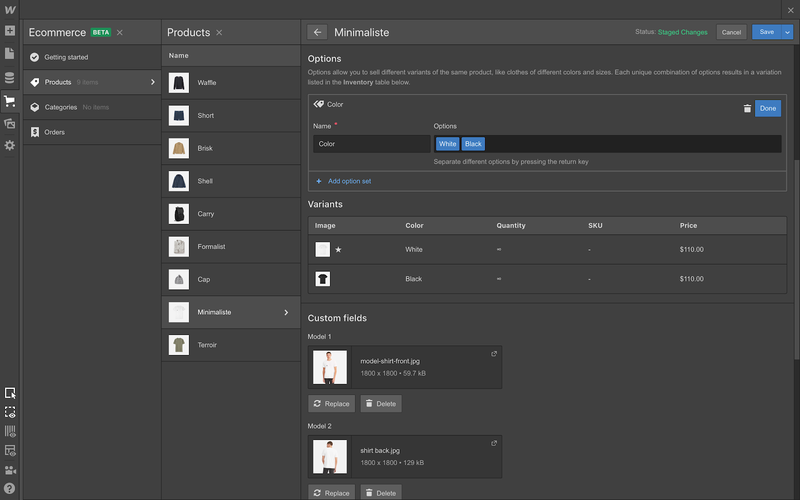 Just open the detail view for your products in the Designer or Editor, then create a new option set for each dimension that product has. 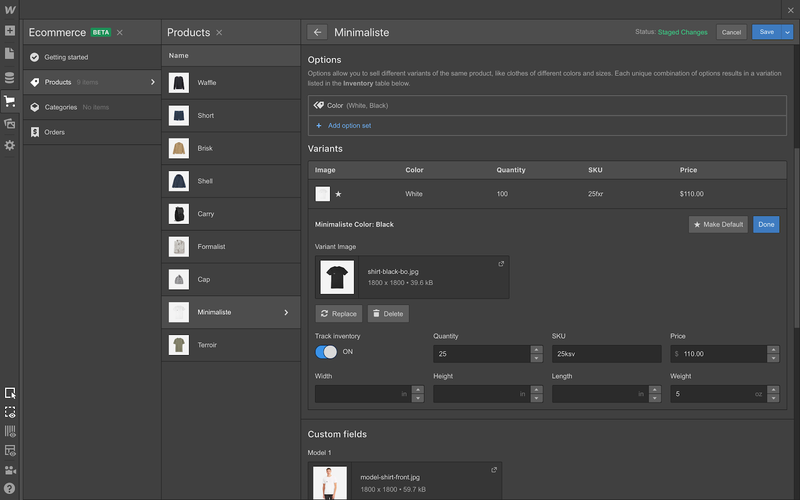 Create an option set for each dimension (e.g., color, size) your product has. Once you’ve created your option set, you can add all the variants you want to sell, then set unique thumbnails prices, specs, and inventory for each as needed. Customize the images and details for each variant. On your product page, you’ll see a new dropdown element that lets users switch between the different options available for that product. More customizable variant selectors: so you can push your design beyond dropdowns and have more creative freedom when designing the variant selector buttons. More flexible image options: so you can have multiple images change when you switch between variants. Variant-specific URLs: so you can create links to product pages that directly select and display the desired variant. If you have additional enhancements you’d like to see for variants — or for ecommerce more broadly — go ahead and create an item in our wishlist. Thanks in advance! Note: You're able to create up to 3 option sets per product, with a limit of up to 50 variants total. Now you can add product options like size, color, and material (or whatever else you have in mind) to sell multiple variants of the same product.